Andrea Maack has been a beloved SOYA supporter since it´s launch, an artist and perfumer by trade, also known for her intercontinental fashion ininfluence, @andreamaack joins SOYA for a special sunglasses collaboration. Inspired by the Andrea Maack universe and her native Iceland, Matteo Pontello of SOYA has designed a brand-new model that clearly mirrors her Nordic roots and signature style. Maack has been recognised for her personal style and connection to fashion and gathered a large following on social media, where she documents her universe mixing high-end fashion with extreme landscapes. Back in 2015, Maack spotted the newly launched SOYA collection and immediately found that there was a kindred spirit between the brands, both aesthetically and in the overall feel and focus on quality and craftsmanship. Since then the brands have formed a friendship and worked on many shoots together, during all seasons in the rural highlands of Iceland. “Being located on the Arctic Tundra, one could think that sunglasses would not be a stable in my wardrobe, where on the contrary they are an absolute must, when the strong Arctic sun just peaks above the horizon, during the winter months. During the summers the midnight sun shines bright around the solstice, so when SOYA approached me for a collaboration I immediately saw the exciting possibilities of incorporation those themes into the design”. “When SOYA was born, I had the fortune to be introduced Andrea's works, which secretly have been source of inspiration for my future designs. 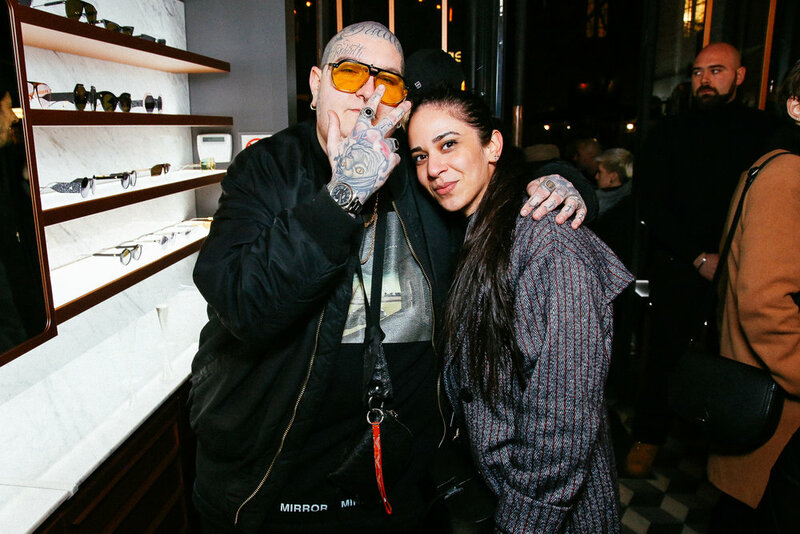 This time, I had the chance of designing eyewear dedicated to herself, inspired by her creations and fragrancesThe sunglasses are born out of an intuition of an upcoming new eyewear trend. The new model shows a 4 mm thick lens, suspended inside a steel frame, bent and fixed thanks to the unique skill of the Italian handcraft. The typical cut of the lens represents the missing part of Andrea Maack perfume bottle; two iconic symbols that are now joined together in harmony. The colours of the lenses are volcanic smoke, orange lava and boreal green: all colours inspired by Andrea's homeland". The striking frame silhouette is an homage to the Andrea Maack signature flacon that in turn references Obsidian the crystallised volcanic rocks found in the Icelandic highlands. The sunglasses are available in three frame colour ways, Matte black, Gold brushed, Shiny gold, with three different lens colours referencing the season characters of the arctic sun including Volcanic smoke, Orange Lave and Boreal green. The collaboration will be available at soya.it / andreamaack.com and arrive in select stores spring of 2019.